Welding is a great career so you should consider becoming a welder. It can be a great choice for you as this job is absolutely rewarding and interesting. If you got interested, it’s time to choose a training program. You can use this article to get info about the best welding certification programs and some more facts about this job. 4 Where Can Certified Welders Work in Kansas? What do you need to become a successful welder and perform your job well? Welding is a process of connecting metal pieces together. To do it, you need to know how to use numerous tools for heating, melting and joining metal. You should know that welding – it’s a career that you can be absolutely proud of. It’s rewarding employment as your work results will be seen for a long period of time. Buildings, bridges and other constructions made by you will be all over the city. Also, it’s absolutely important that the outlook for welding is growing steadily. As the data shows, by 2026 the number of welding career offers will grow by 6%. A median average salary throughout the country is $39,390 per year ($18.94 per hour). At the same time, a median welder’s salary in Kansas is slightly higher. It’s $42,220 per year or $20.30 per hour. At the same time, the top 10% of welders in Kansas earn $61,430 per year while the top 10% of welders throughout the country earn $62 100 per year. Where Can Certified Welders Work in Kansas? A certified welder can find a job in various spheres in Kansas. 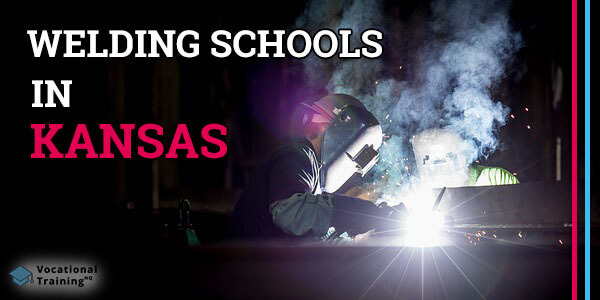 Want to learn about welding training programs available in Kansas? Use the table below to get all the required info. It should be mentioned that we made sure that each school form the list is approved by the American Welding Society’s SENSE Accreditation Program. Whatever program you’ll choose you’ll be able to learn all the important aspects such as Gas Tungsten Arc Welding (TIG), Shielded Metal Arc Welding (stick), or Gas Metal Arc Welding (MIG). Speaking of the main requirements, each participant should have a high-school diploma or GED. Of course, some welding certification schools require only 10th-grade students. Keep in mind that there is a variety of similar career options.